Redmi Note 7 was launched in the Chinese market this month. The most important feature of this phone is the 48 megapixel camera. This smartphone can be launched in the Indian market soon. Now the information about the Global Variant of Redmi Note 7 is revealed. Xiaomi Global spokeswoman, DoNoun Sung, tweeted a picture that is aimed at launching the global variant of Redmi Note 7 soon. Redmi Note 7 handset comes with 4,000 mAh battery, 2.5D glass protection and 6.3 inch display. Dovanna Sung has tweeted a picture in which a stage appears with the screen. It is written on 'Redmi Note 7. Stay Tuned'. This is clearly pointing to the global variant of Radmi Note 7. 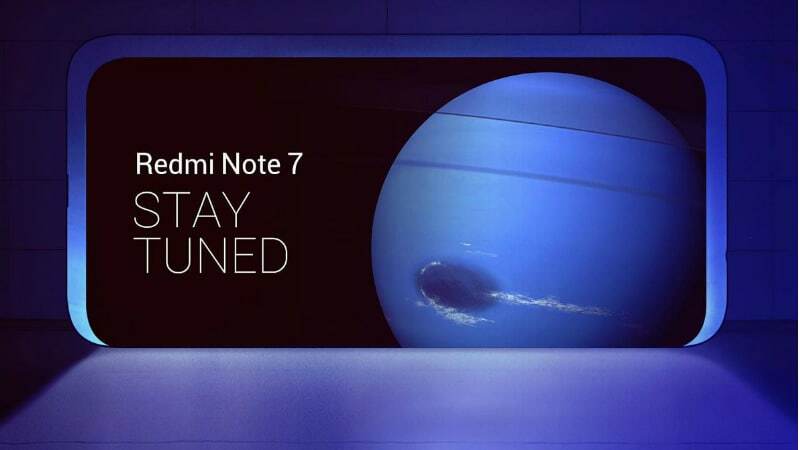 Recently, Shomei India's chief Manu Kumar Jain had published a teaser to bring Radmi note 7 to India. It is possible that the Redmi note 7 will be brought to India first after China. Redmi Note 7's Global Variant Teaser has been launched soon-Dovanna Sung has tweeted a picture in which a stage appears with the screen. It is written on 'Redmi Note 7. Stay Tuned'. This is clearly pointing to the global variant of Radmi Note 7. Recently, Shomei India's chief Manu Kumar Jain had published a teaser to bring Radmi note 7 to India. It is possible that the Redmi note 7 will be brought to India first after China. In the Chinese market, the price of Shaoomi Redmi Note 7 is 999 Chinese Yuan (about 10,300 rupees). There will be 3 GB RAM / 32GB storage variants at this price. The price of this phone has 4 GB RAM / 64 GB storage variant is 1,199 Chinese yuan (about 12,400 rupees). The premium variant of Xiaomi Redmi Note 7 has 6 GB RAM / 64GB storage and its price is 1,399 Chinese Yuan (about 14,500 rupees). The Dual-SIM (Nano) Redmi Note will run on Android Orio based on the 7 MEUI 9. It has a 6.3 inch Full HD + (1080x2340 pixels) LTPS display with an aspect ratio of 19.5: 9 of this handset . Corning Gorilla Glass 5 and 2.5 D Curved Glass have been used for screen protection. For speed and multitasking, the 2.2GHz Snapdragon 660 octa-core processor will get 3 GB, 4GB and 6GB RAM. There are 32 GB and 64 GB storage for saving photos with video and other things. Talking about camera setup of this price segment ,Redmi Note 7 has two rear cameras. With LED flash and the 48 megapixel Sony IMX 586 sensor, whose body is F / 1.8 and the secondary camera is 5 megapixels. In this price ,13 megapixel front camera for selfie has been given. To recharge the phone, a 4,000 mAh battery is provided which comes with Quick Charge support 4 . Connectivity includes USB Type-C port or 3.5mm audio jack or 4G VoLTE, Bluetooth and Wi-Fi support. Hey Friends, welcome to the my blog, TECHTOX EXPRESS I’m Jay Prakash Majumdar a professional blogger from North Dinajpur west Bengal, India. I started TECHTOX EXPRESS as a passion, and now it’s empowering more than 10000+readers globally by helping them to make money and live a boss free life. Here at Techtox Express, I write about starting managing a blog, WordPress, social media, SEO, and making money online. You can read more about SML at the “ About ” page. 2-Factor Authentication Kaise Kare? How to Enable Two-Step Verification ? Hey Friends, welcome to my blog, TECHTOX EXPRESS I’m Jay Prakash Majumdar a professional blogger from North Dinajpur west Bengal, India. I started TECHTOX EXPRESS as a passion, and now it’s empowering more than 10000+readers globally by helping them to make money and live a boss free life. Here at Techtox Express, I write about starting & managing a blog, WordPress, social media, SEO, and making money online. You can read more about SML at the “ About ” page.